The BOOKMOBILE is not in service at this time. "We deliver books that fill your head with great ideas!" 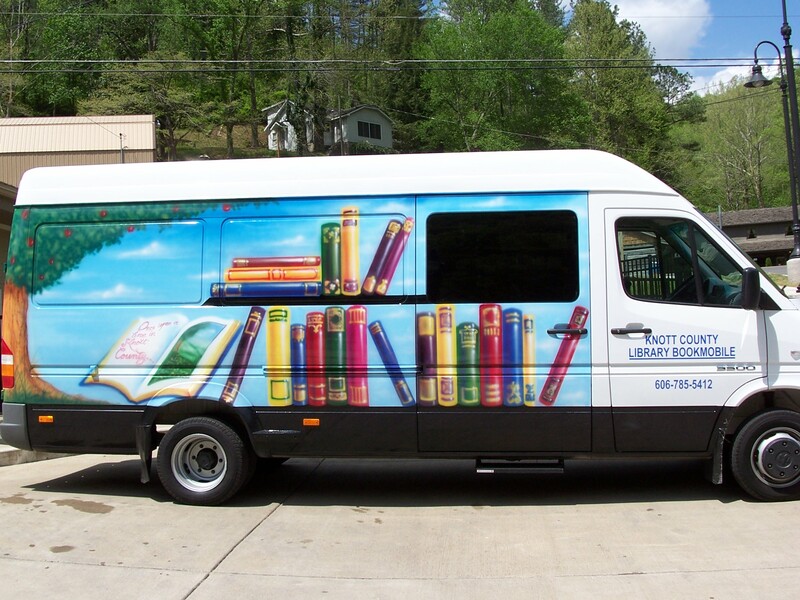 OUR PURPOSE The Knott County Library Bookmobile provides personalized library service to people who may have difficulty using traditional library services--including seniors, the physically limited, stay at home mothers and their children--or just anyone who wants to use the bookmobile. COLLECTION The Bookmobile carries a range of items, including books for children, teens and adults, bestsellers, large-type titles, magazines and a large variety of paperback books. PLACING REQUESTS Items not found on the Bookmobile may be reserved and delivered. Once the item becomes available, it will be delivered to the patron's regularly scheduled stop. CIRCULATION POLICIES AND PROCEDURES Items checked out on the Bookmobile may be kept for two weeks, or until the next visit of the Bookmobile to that stop. No overdue fines are charged on the Bookmobile--just return the item. If the items are indeed lost, damaged or not returned, a charge for the item and processing fee will be charged. Items may also be dropped off at the library or in the book drop, located outside the library building. BOOKMOBILE RUNS The bookmobile runs year round on a two week schedule. No runs will be made on days when the Knott County School system closes for snow days or for poor road conditions. Listen to radio station WKCB for information concerning school closings and days when the bookmobile will not run. For more information, or to schedule a stop, contact the library at 785-5412. Find your community from the list below to print out a schedule of when the bookmobile runs in your area! If your area is not listed, call the library for times and for more information.